Kindergarten Dance – Uneven Rhythms and Locomotor Moves Developing the gallop, skip, and slide, traveling into empty spaces to rhythmic patterns and music Drum, recording of “The Irish Washerwoman” or another jig. You may substitute a variety of spirited, traditional folk dance music (see Celtic Dances and Aires). 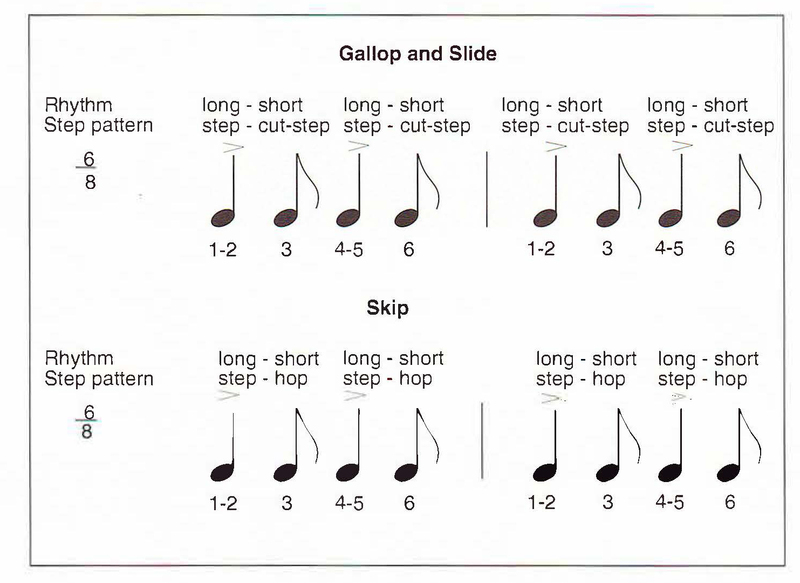 Demonstrate increasingly mature patterns of skipping, galloping, and slid­ing (reflects National Standard in Dance lb). Entrance Routine 1< min Have the space set up with the boundaries clearly marked, have the music on low as the children arrive. Transition 1 < min Welcome, come into the boundaries and begin traveling around to all the open spaces. Part 1 Warm Up Review 5­‐10 min Warm up with a fun movement song. this one works on listening and moving like various animals and sports activities. Part 2 New Skill 10­‐20 min Skip, Gallop, and Slide! 1.1 Some of you have nice open spaces around you. Let’s all try very hard to keep big, empty spaces or bubbles around us as we travel to the music. Be careful not to bump anyone’s bubble. 1.2 [Observe for different ways of traveling as well as for children traveling into open spaces. Some will run and jump, others may skip, gallop, or slide.] I see so many different ways of traveling! [Lisa], show us how you can gallop. Each time she gallops, [Lisa] reaches out with the same foot. I’ll play my drum ­listen [uneven long-short, long-short rhythm]. Let’s all try galloping, keeping one foot out in front. [After several steps, change the lead foot.] Give your other foot a turn being the leader. 1.4 Now, watch [Doug]. He can travel sideways [child demonstrates]. When you travel sideways, keep reaching out with the same foot. Your gallop magi­cally becomes a slide! Let’s all try to travel sideways and slide. Ready? Slide, and slide, reach out, reach out! [Repeat this long-short rhythm, starting and stopping often.] Can you change directions each time we stop? Reach out with your other foot. Slide sideways the other way! 1. 7 Cover our whole dancing space with skipping! Keep looking for empty spaces in front of you. [Continue uneven rhythm.] Remember to wait or skip in place so others may pass by [or skip around somebody, or face a different way and skip to a new empty space]. Really push off the floor with the balls of your feet. Take your skip into the air. [Ob­serve the leg and arm actions of this skipping pattern. Teaching Tip: Emphasize skipping forward at first. As they make developmental progress, children will vary their directions, skipping back­ward, sideways, or turning. Transition 1 < min Stay in your own space. 2.0 Mix up the ways you travel. Show skipping, galloping, and sliding. [Play an uneven drum rhythm or music.] Can you change the size of your traveling steps? Sometimes make steps very big and other times make them very small. Big, long steps. Little, short steps. 2.3 Everyone moving together again, As you pause for four counts, show what your hands and feet do to keep time to the music. [Tap or stamp feet, clap hands, slap sides.] Let’s all try [Julita’s ] way of keeping time to the music. [Tim ] had a different way to keep time to the music. Can you try [Julita’s or Tim’s] way? Can You Vary Your Movement? 3.6 When you perform for an audience, hold your beginning position or shape very still. This tells the audience to pay attention I You must also show the audience when your dance is finished by holding your ending position very still. Let’s try the dance again and see if you can hold your beginning and ending positions as still as a stone statue. 3. 7 As you travel, try to focus [glue] your eyes on something far away that will make you hold your head up high. This is called a focal point. [Repeat part of the dance.] You want to have a nice long feeling from your head to your toes as you travel. Stretch and lift through your chest. Let’s Try It With a Partner! 4.2 You skipped together so nicely. Can you gallop and slide together as well? Try galloping and sliding with your partner. 4.3 Be sure to count how many gallops and slides you are taking so you are ready to stop and pause four counts. Turn to your partner and tell each other what your favorite part of the partner dance was.